One of the great pillars of electronic music, and music in general, is common space to experience art and music with no cost associated and full access to every member of the community. As BassBus was first coming to life, around 2010 or so, Calgary experienced a publicly funded event called Snowblower, where international calibre artists proved to Calgary that we could experience cutting edge music in our public spaces just like any other globally relevant city. In that context, it was a thrill for BassBus when glow: Downtown Winter Light Festival approached us to curate part of their performance series. The intention for glow and the Calgary Downtown Association was for us to provide talent and production on the marquee Saturday night for the festival, which meant that as part of the event’s larger umbrella we had access to Olympic Plaza with the goal of creating positive, free, family friendly music for the larger Calgary community. With that directive, Nightlight was born. An evening of international and local music talent, and warm glowing stage performance, in the deepest, coldest nights of winter. So how did we gear up to fight the winter’s worst? Event production is an adventure in the best of circumstances, so to take on a complicated endeavour in sub zero temperatures in one of Calgary’s busiest locations is even more involved. Luckily, with our team fervently working on their particular angles of creation, the atypical situation only lent itself to unique results. 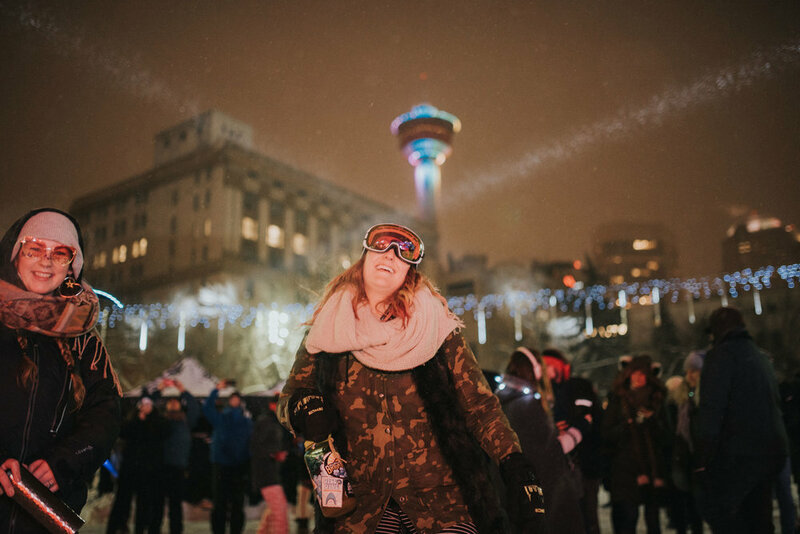 As an inaugural event, the BassBus team had to find a way to craft not only an engaging event in Olympic Plaza, but a brand and aesthetic that indicated the role this event was to play as part of glow Calgary: a warm, glowing centre of art and music in the centre of Calgary. Marketing Manager Chantal Limoges and Creative Content & Communications Manager James Nason executed a creative process intended to flesh out a look and feel that reflected both glow Calgary’s family friendly, cross-city focus, as well as the BassBus underground and niche musical edge. It’s not always easy to marry cutting edge underground art with city wide, all ages appeal, but BassBus has been perfecting that formula for years now. Chantal and James, in collaboration with graphic designer Ayra Peredo, managed to walk that line effectively with a logo with a certain universal, child-like appeal (a glowing firefly melded with a light bulbb) and high contrast, colourful images of bioluminescent life in nature. Similarly, booking talent for an outdoor event in the depths of Canadian winter poses unique challenges. 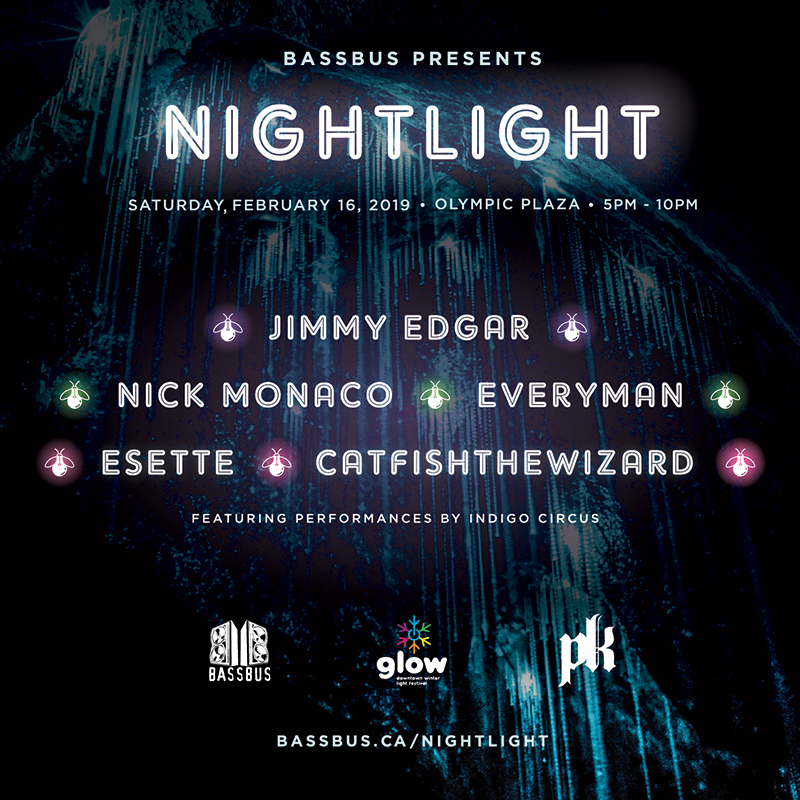 While certain artists on the docket for Nightlight were well acclimated to the challenges of winter -- Detroit-born Jimmy Edgar had played Igloo in Montreal, and EVeryman and our local DJs Esette and Catfishthewizard are deeply acquainted with Calgarian winter -- our San Francisco- and Barcelona-based house and disco performer Nick Monaco arrived ready to take on the cold… in shorts. We provided him enough warm gear to keep from going loopy in the cold, but non-traditional venues do create non-traditional challenges. Production & Talent Manager Julie Mercier faced a similar challenge in that the stage performers would need to execute physically challenging moves and wear LED lit costumes in tough conditions, so the performance troupe on call needed to be experienced, well prepared, and willing to deal with the cold. Luckily, Indigo Circus was the perfect team to take that on, and their custom costumes and bravery meant they were doing splits and brightening the stage much of the evening. The deeply collaborative BassBus process meant our stage designer Jessica Bedford had early exposure to the vision and brand Nightlight espoused. After an initial team meeting, she understood the need for Nightlight’s visual impact to be oriented around warm, glowing, natural life, and her final product was a high value, impactful piece when completed and matched with a top calibre light system. Jessica’s concept was to use a CNC machine to cut branded and themed natural shapes onto a backdrop which utilized the shapes as negative space for LED wall panels to shine through. Alex Bridge and Chris DePape provided light design and gear which turned those negative spaces into undulating, pulsating waves of light behind mushrooms, fireflies, and other glowing natural phenomenon. The aesthetically conscious marriage of those two team elements meant BassBus’ contribution to glow and the Nightlight aesthetic was an appropriate link to the larger festival, as well as a dynamic backdrop for Indigo Circus. Aside from stage specific lighting, the audio and lighting teams had logistical feats to accomplish to pull off their tasks. Many of the lights typical for larger stage productions couldn’t be utilized for Nightlight, since snow was actively falling the day before and day of the event, so gear which could be impacted by falling moisture might have failed or been unsafe. More durable Sharpie lights were selected to create the warm, glowing centre Nightlight needed, and 70 Yes Tech 5 mm LED panels were the stage related centrepiece behind Jess’ CNC design. That backlit system was controlled by Resolume to be a live, improvised light response programmed by our technicians. 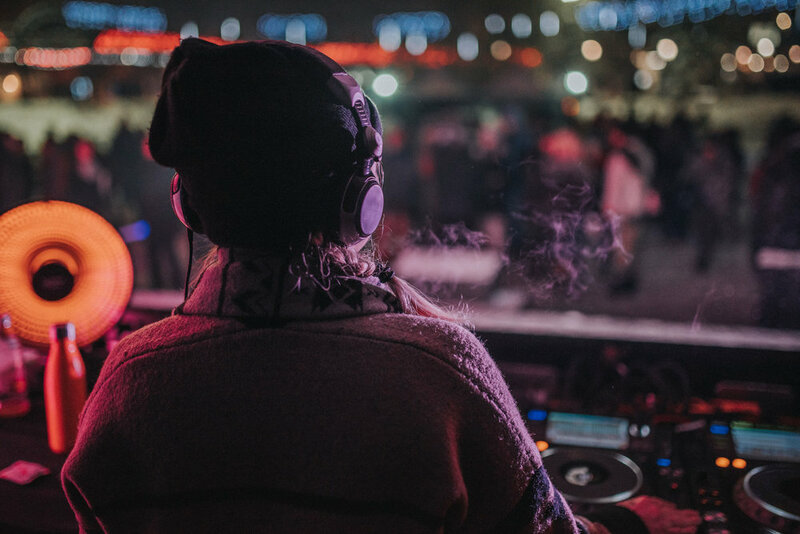 PK Sound contributed a significant array of subs to ensure Olympic Plaza was full of as much punchy, trademark BassBus sound and vibe as the city’s permitting process would allow. One array of CX800 subwoofers and a VX10 compact line array were the critical core of the PA for Nightlight. When all was said and done, foot traffic in the downtown area was around double the expected turnout, with around 100,000 individuals counted livening up the Stephen Avenue and related festival areas over the course of the entire glow Calgary event. Downtown truly came alive with that critical glowing centrepiece the Calgary Downtown Association hoped for, and BassBus is thrilled to have activated Nightlight as part of that.